This is another recipe that has earned being made multiple times. 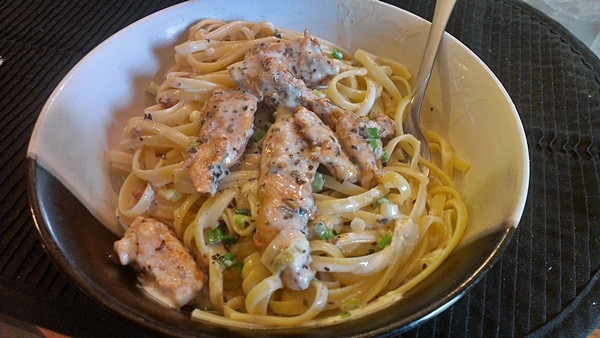 I love pasta and I love Cajun and also chicken, so this recipe it perfect to me. Yum. Yum. YUM. Place chicken strips and Cajun seasoning in a bowl, toss the chicken with the seasoning until the chicken strips evenly coated with the seasoning. In a large skillet over medium heat, melt butter. Add chicken and saute the chicken for 5 to 7 minutes or until the chicken is fully cooked. Reduce heat to low. Add green onions, heavy cream, basil, salt, garlic powder and black pepper. Cook until heated through. Pour over hot linguine and toss with Parmesan cheese.